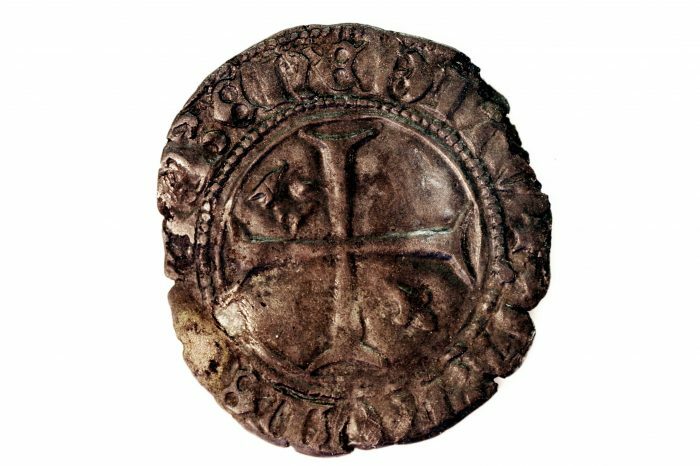 The French “petit blanc”, literally ‘little white’ was a small, low value coin found within the keel of the Newport Ship and is believed to have been put there for good luck as there was a superstition at the time that a cargo ship that had no money doomed its owners to failure. The petit blanc helps to date the Ship’s construction to the latter half of the 1440’s, following investigation by the Project team and the Friends of the Newport Ship this coin is one of 65,000 coins ordered by the Dauphin of France later Louis XI and minted from May to July 1447 in the town of Cremieu. 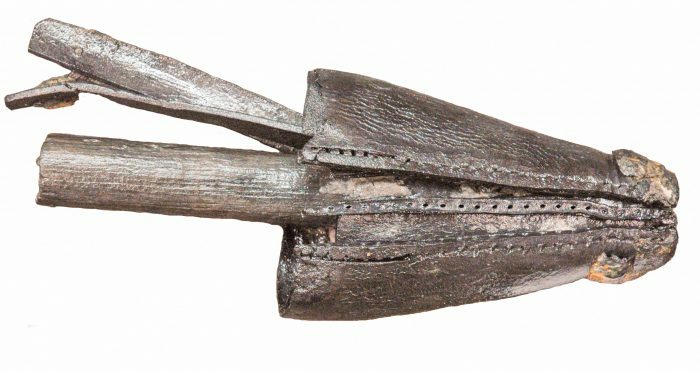 Including the data from the dendrochronology work done on the Ship’s timbers this gives us, an unusual for the time, hard stop on how old the Ship could be given that the ship’s keel would have been the first part of the ship to be laid. 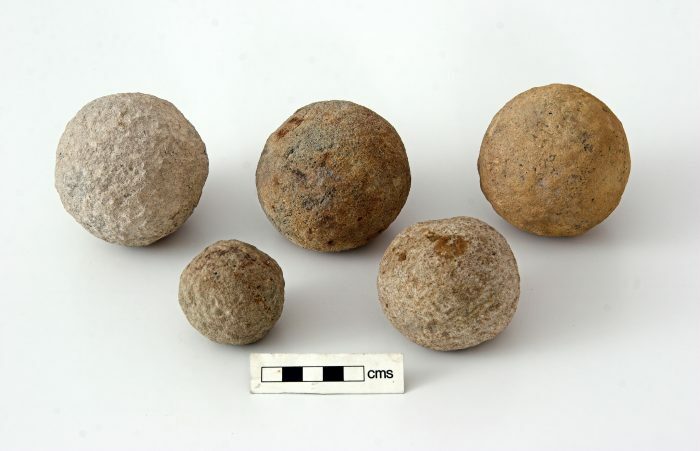 Weighing a few hundred grams these are not the ship sinking cannon balls of later years but were most likely fired from a swivel gun mounted on the ship for repelling boarders or taking out the personnel of other ships. The archer’s brace is used to protect the shooter from the slap of the bowstring against their arm while shooting. 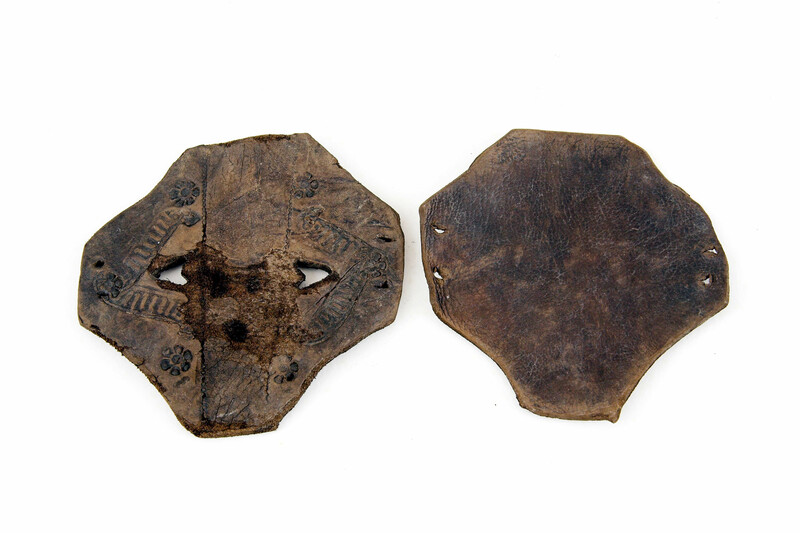 Given the valuable nature of the cargo vessels like the Newport Ship were carrying it is likely that she would have carried a number of armed men and that the crew would have had some experience in defending themselves. 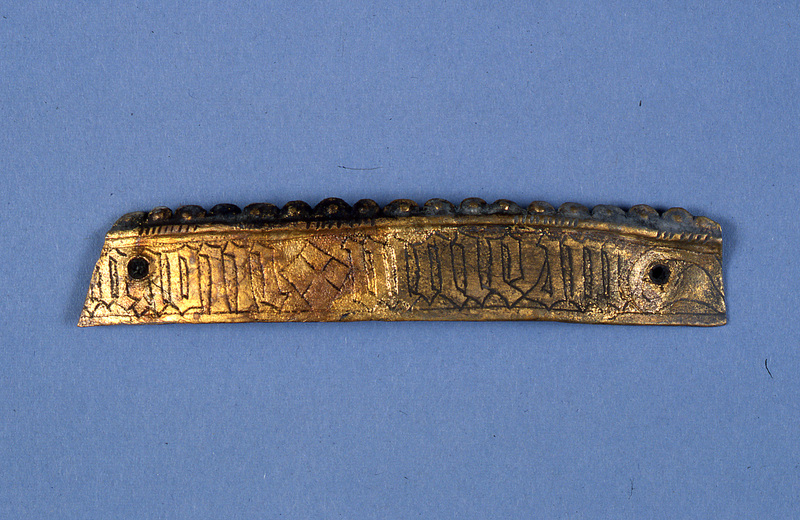 This is a section of brass strap from an iron helmet found during the excavation of the Newport Ship and adds further evidence that there were a number of arms men stationed aboard the ship during its lifetime. Travelling by sail is a relaxing but time consuming experience, we believe that the Newport Ship was trading between the UK, Germany and Portugal with each of these journeys taking several weeks it is understandable that the crew would require entertainment. 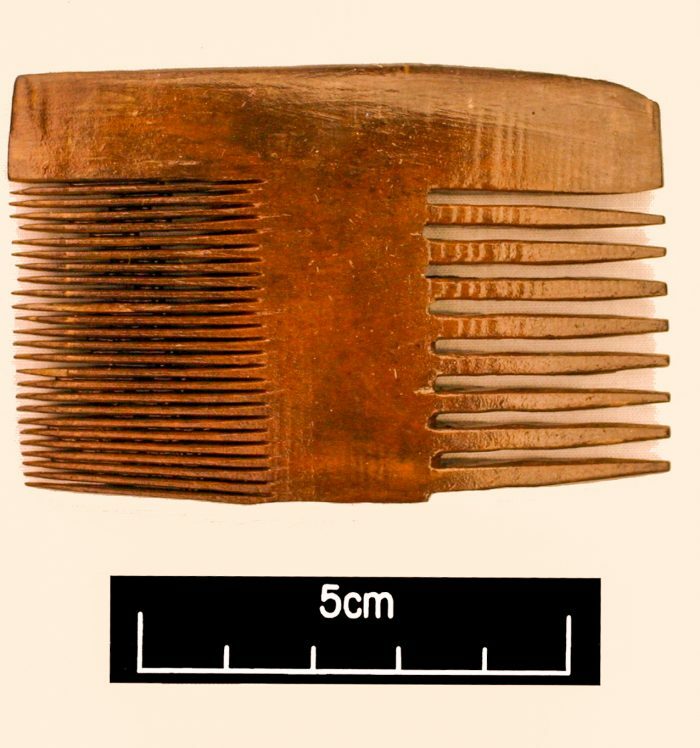 Grooming in the Medieval Period was more widespread than popular belief would have you think, as evidenced by the combination nit comb above, that hasn’t changed much in the intervening 540 years. This would have been used to pump out the bilges where excess water would gather in the bottom of the ship and would need to be removed. 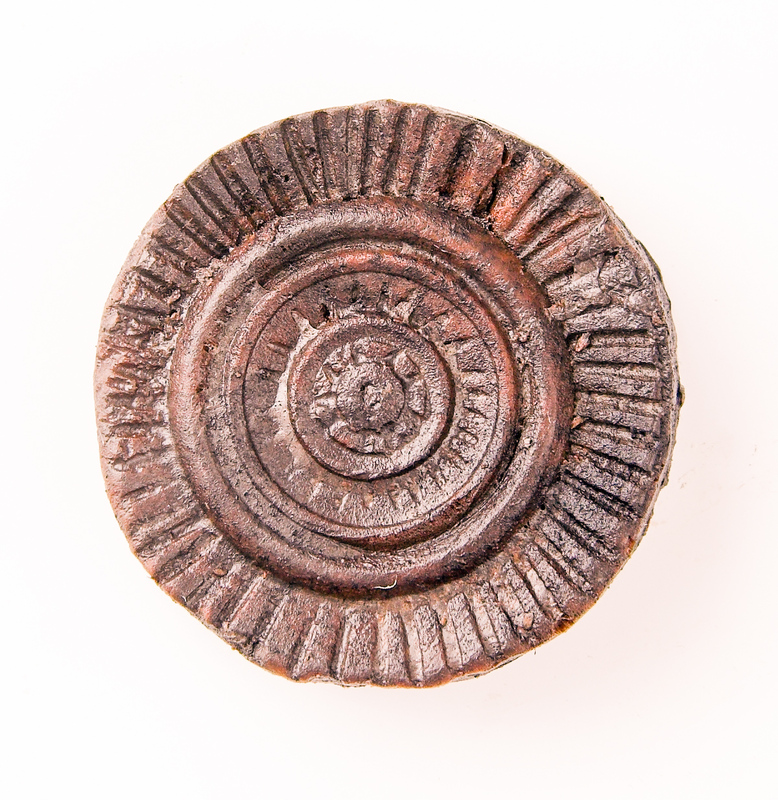 This is the only example of a bilge pump from the medieval period.